When I first started researching green building I found pretty quickly that the vast majority of material, books, websites, etc. are made for people living in the temperate zones of the US and Europe. There is a ton of material for them. When you look for green building resources for the tropics though, not so much. The primary challenge to designing and building a house in the tropics is cooling and this creates a major difference in strategies and techniques compared to temperate design. In some cases, strategies for summer time cooling in the temperate zone can be used in the tropics, but not always. The main techniques for cooling in the tropics are shade and ventilation. Managing the moisture that comes with the rainy season for at least half the year in most places is another challenge. Many types of green building methods draw on indigenous knowledge including adobe, rammed earth, bamboo, and thatch and designs including wind scoops, wrap around porches, and roof overhangs. The trade off between heavy heavy building materials (stone, clay, cement) vs. light (wood, bamboo) and thermal mass is an ongoing balancing act. 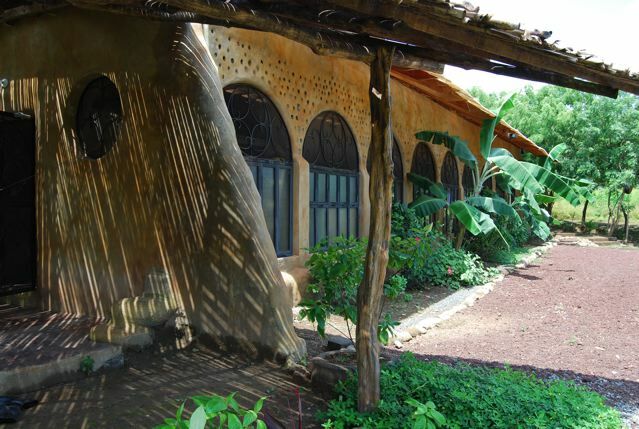 One type of green building is the so-called Earthship (with an example in Nicaragua) that requires modification or adaptation to function well in the humid tropics. Earthship’s were designed for high latitude, dry climates, hot is summer and cold in winter. The standard south-facing glass wall, used for solar gain in winter to heat the thermal mass of rammed-earth tires, does not apply to the tropics. Basically, in designed for a tropical earthship, you try to negate the entire glass wall by blocking the sun’s entrance. It could instead be a wall made with any material like cement or wood. The Earthship’s thermal mass is the design solution, in high latitudes, for gaining heat during the day, storing it and releasing it during cold nights. This is the opposite of what you want in the tropics, so again you are trying to negate the thermal mass, by shading it from the sun, having a low density attic (which would simply mean a second floor built with wood or other light materials and well ventilated), large roof overhangs, and trees and vegetation blocking the south side sun. Since you are actively trying to negate the effect of the earthship walls (reduce their thermal heating qualities), why not use materials that have less of those thermal characteristics, like bamboo or other light materials? Traditional earthships may be partially buried, using the earth’s greater thermal mass to further cool the house in summer and heat it in winter, again, a good design in hot/cold seasonal dry climates. However, in the tropics we need to consider moisture during at least half the year when there in heavy rainfall and high humidity. I know from experience working on a berm house construction project that leakage and seepage from the earth is a constant threat and more materials, cement and plastic sheeting, is required to battle it. Burying a house in the tropics is not a good option and in fact you usually want to raise it. For tropical earthships it seems cooling tubes are a requirement to keep the structure cool. Tubes buried 1m (3.3’) deep and running 100m (330’) are needed to draw in air that is cooled by the earth’s thermal mass, enters the house and continues to be drawn up and out through a thermal chimney (black painted roof chimney that creates warm air suction). This is another technique that can be used with any house design, however digging long and/or deep trenches for tubes is not always easy depending on the land (soil, slope, vegetation etc). Traditional (= tried and true) architecture in tropical climates is not about high thermal mass but about ventilation, low thermal mass, and using design techniques for keeping dry during tropical downpours. Houses are raised for ventilation underneath, to reduce moisture uptake and also discourage pests etc. The design is based on many windows, open spaces and cross flow of air, unlike earthships. You are still using low roof overhangs, south-side sun blocking with trees and vegetation and other passive cooling tricks, but you don’t have to fight a huge thermal mass, just a light, well-ventilated one. Cooling tubes are a bonus but are not required to cool the structure. The earthship method of rammed-earth tires can be used for foundation work, columns and low walls, basically in place concrete, blocks, brick or stone. If the availability of tires is easy and the cost trade off with other materials if favorable, then it makes sense. It may also make sense to employ a modified thermal mass idea whereby the north face of the structure is done as an earthship wall and either partially buried (paying particular attention to drainage from rainfall and surface flow) or back-filled to create a cooling contact with the earth. 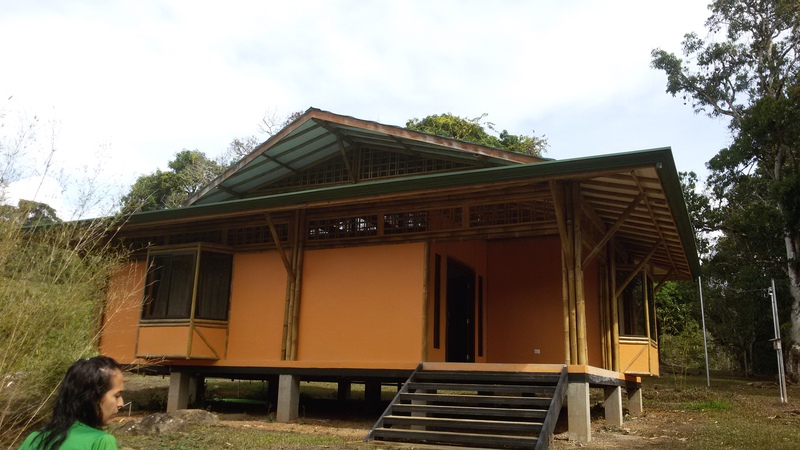 This entry was posted in Building in Nicaragua, Green Building and Bamboo. Bookmark the permalink.